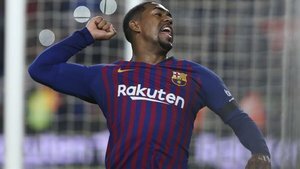 Guangzhou Evergrande, managed by Fabio Cannavaro, have made a list of transfer targets which features Barca winger Malcom, as well as Palmeiras forward Dudu. Various media sources say the Barca winger is a priority and that he is a suggestion of Andre Cury, Barca’s South American assessor and the agent of Dudu, another player he has suggested to the Chinese Super League club. Cury took Paulinho back to Guangzhou for 50m euros a year after they sold him to Barca for 40m, which created some controversy. For a while, Cury has tried to bring Dudu to the Chinse league with Palmeiras president Mauricio Galiotte rejecting offers from Changchun Yatai and Shandong Luneng, who offered 13m and 15m respectively. Barca paid 41m euros for Malcom to Bordeaux, a deal that Cury also worked in as an intermediary, taking him away from Roma just when it seemed they had signed him. Guangzhou also have three other Brazilians in their ranks - Talisca, Alan and Goulart, as well as Paulinho.